March 18 is Flag Day in Aruba. This holiday is full of different events, like carnivals and fairies and it celebrates the anniversary of flag adoption in 1976. 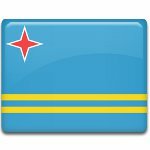 Current state flag of Aruba was adopted on March 18, 1976. It consists of a blue field with two narrow parallel horizontal yellow stripes and a four-pointed red start with white fimbriation. Every element of the flag is symbolic for the country. Blue color of the field stands for the sky and the sea, it's also the color of hope, peace and Aruba's future. Two narrow yellow stripes suggest the movement towards “status aparte” (Aruba is a part of the Kingdom of the Netherlands). Yellow color of the stripes symbolizes wanglo, Aruba's national flowers, sun, gold and abundance. The most complex symbolism has a star. First of all, the star is unusual, because it has only four points, representing the four cardinal directions. These refer to the countries of origin of the Arubans. The star also represents the island itself, that has red soil bordered by white beaches. White color of the fimbriation stands for purity, honesty and white beaches. Red color symbolizes blood the Arubans shed during the French pass war.